Every turn, one monster appears. 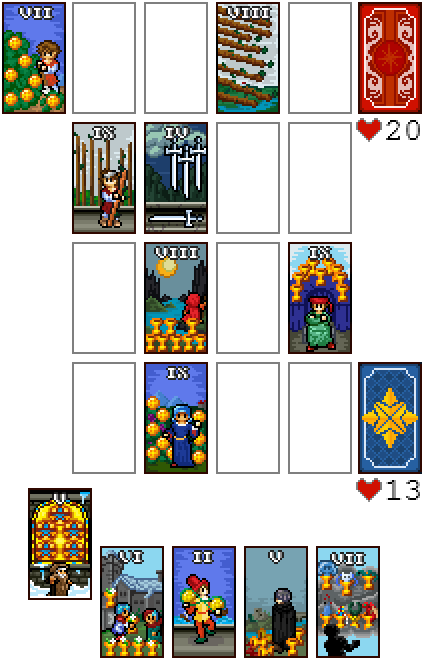 You can play one card per turn: simple cards (with just a number) can be summoned on a lane to defend your kingdoms. Spell cards (with a word on the bottom) have special effects that are described below. You destroy the ennemy card if the sum of the strength of your cards on the lane is greater or equals the strength of the ennemy's. Same goes for the ennemy. If a lane is undefended, the warriors attack directly the opponent's health. Bring your opponent's health to zero to win the game ! Death - Destroy all warriors on a lane. Justice - All the warriors of the lane get the strength of the weakest warrior of the lane. Couldn't find from where the background comes from. Feel free to send me a message if it comes from you.